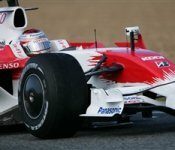 On the third and final day of the last pre-season test, Jarno Trulli set the fastest lap time. The Italian was followed by David Coulthard, who returned to the track after an injury, and Nico Rosberg. The teams will now go back to the factory for the final preparations for the season opener at Melbourne. 27-02-2008 Dennis fired as Team Principal?